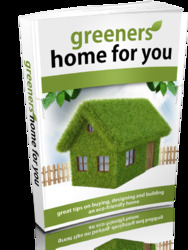 Section 4 of EN 1998-1 contains special rules for the analysis and design of frame (or frame-equivalent) concrete buildings and of unbraced steel or composite buildings with non-engineered masonry infills (see Section 4.12 of this guide). These rules are mandatory only for buildings designed for DCH. If the building is designed for DCM or DCL, the rules of Section 4 are considered to serve only as a guide to good practice. Section 5 contains additional rules for concrete buildings with infills, which apply to buildings designed for either DCH or DCM, (but not for DCL), irrespective of the structural system. The objective of these rules is to protect concrete buildings from the adverse local effects of infills. 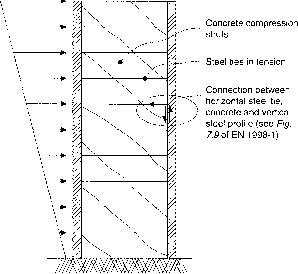 • a reduction in the clear height (and hence in the effective shear span) of columns due to contact with (and restraint by) infills over part of the full height; the resulting 'short' or 'captive' column is prone to flexural/shear failure or a pure shear failure dominated by diagonal compression. Clause 5.9(1) Part of an infill panel may be dislocated by failure or heavy damage, exerting a concentrated force on the adjacent column. The stronger the infill, the larger the magnitude of this force and the higher the likelihood of local column failure. Infill panels are more likely to fail or suffer heavy damage at the ground storey, as there the shear force demand is largest. For this reason, in buildings with masonry or concrete infills, the entire length of the columns of the ground storey is considered a critical region and subject to the corresponding special detailing and confinement requirements, to be prepared for local overloading by the failed infill panel at any point along its height. Clause 5.9(3) Unbalanced contact conditions may take place in columns with a masonry infill on only one side (e.g. corner columns). The entire length of such columns is considered a critical region and subject to the associated special detailing and confinement requirements. (2) the term min(...) taken equal to 1.0, at the column section at the termination of the contact with the infill wall. 9 consider the entire length of the column as a critical region and provide it with the amount and pattern of stirrups specified for critical regions. Equation (D5.53) is the counterpart of equation (D5.47) for squat columns; all variables in it are defined as in equation (D5.47), except (1) the internal lever armz, which is taken here to be equal to z = d-d' and (2) 6 in the last term, which is the angle between the axis of the column and its diagonal in elevation (tan 9 = hJ2Ls). Equation (D5.53), proposed by Biskinis et al.,69 has been adopted in Annex A of EN 1998-352. (2) changing the cross-sectional dimensions of the column. 8 if the shear span ratio, LJhc, of the column increases above 2 (or, preferably, 2.5) its behaviour in cyclic shear will not exhibit the special vulnerability and low dissipation capacity which characterizes short columns • the decrease in the cross-sectional dimensions will reduce the design shear force from equation (D5.12) (by reducing the design values of the flexural resistance of the column, MRdc ¡, i = 1,2) more than it will reduce the nominal shear resistance, helping both the verification as well as the physical problem. Reinforcement placed along both diagonals of the clear length of the short column within the plane of the infill is very effective in increasing its energy dissipation and deformation capacity. Placement of such reinforcement, in addition to or instead of the conventional transverse reinforcement of the column, is another viable option. This reinforcement may be dimensioned to resist at the same time the design shear force from equation (D5.12) as well as the design bending moments at the end sections of the short column, in accordance with the relevant rules for coupling beams in coupled walls. Placement of such reinforcement and its dimensioning to resist the full value of the design shear force is mandatory, if the clear length of the column, ld, is less than 1.5hc (corresponding to a value of the shear span ratio, LJhc, less than 0.75). (2) the shear force computed from equation (D5.12), applied with clear length of the column, ld, taken as equal to the contact length, lc, and the parentheses in the numerator equal to twice the design value of the column flexural capacity, 2MRd c.
In case 2 the contact length should be taken as equal to the full vertical width of the diagonal strut of the infill. This is consistent with the calculation in case 1, which conservatively assumes that the full strut force is applied to the column. It is also closer to the reality at the top of the column, as there the joint between the top of the infill and the soffit of the beam may be open due to creep of the masonry or concrete infill.